Artificial Eye's second collection of Satyajit Ray films gives us relative newcomers a glimpse of another side of this extraordinary filmmaker's cinema. Although all of them are technically feature films, two are little over an hour in length apiece, one of them mockingly comedic in nature, albeit with serious undertones. The third of the trio, and the only film in either collection in colour, is a detective story which also has a nice line in character humour. Mahapurush is half (it's a matter of choice which comes first) of a pair of companion films completed with Kapurush (see below), the titles translating as The Good Man and The Bad Man. Simple morality tales, you might think, but you're not long into Mahapurush before you realise that Mr. Ray sometimes selects his titles with a dash of irony. The Good Man in question is Mirchai Baba, a travelling holy man whose stories and healing abilities attract crowds and devoted new followers wherever he goes. All is going well enough until he hooks widower Gurupada Mitter and his daughter Buchki, which scuppers the plans of Buchki's would-be suitor Satta, who pleads with his friends Nitaida, Nibarankaku and Parak to help get rid of this disruptive interloper. The trick, which we're clued in to from an early stage, is that Mirchai is a fraud of the highest order, a comically ludicrous charlatan who brings light to the world by commanding the sun to rise at dawn, claims to drain energy from the skies and spark it into the needy, and holds court to a mesmerised group with tales of his conversations with Plato and Jesus and how he advised Einstein on the theory of relativity. "How old is this Babaji?" asks Parak, "2000?" "Oh God, Parak," responds Nibarankaku, "Sell him an insurance policy. You will get many premiums." Although Satta's companions appear to do little more than lie around pondering the state of the world, Ray clearly aligns himself and the film with their cynicism and scientific logic, missing no opportunity to mock this false prophet or the gullibility of his followers, who at times seem almost as daft as the adoring hoards in Life of Brian. This lampooning has its serious side, a debunking not so much of religion itself but those who exploit it to their own ends, a view neatly summed up when Nibarankaku deconstructs Mirchai for the others and convincingly justifies the need to expose him. A political statement, perhaps, but a hugely entertaining and frequently very witty one, not just in the sprightly dialogue and performances, but also in Ray's shot selection and editing instinct – the beautifully timed moment when the image of Mirchai handing out enchanted chilli peppers from the steps of a train carriage cuts to the worried face of the station master – unwilling to disrupt the display but anxious that his train will not leave on time – made me laugh out loud. The irony alert continues with Kapurush, aka The Bad Man, given that the only crime committed by its protagonist, if it can be called a crime at all, is a failure to commit himself at a time of self-uncertainty, a decision that later comes back to haunt him. Young screenwriter Amitabha Roy is left stranded by repairs needed to get his car back on the road. Overhearing his woes, cheerful plantation owner Bimal Gupta offers him a bed for the night at his sizeable estate. Roy gratefully accepts, but on arriving at the house he reacts with startled surprise when he meets Bimal's wife, Kuruna. Is it because he's so captivated by her beauty? Perfectly possible, given that she's played by Ray regular Madhabi Mukherjee, but there's clearly more to this than instant attraction. Amitabha expresses his astonishment at finding Kuruna again, something she does not respond to one way or the other. Has he mistaken her for someone else, or has a once close relationship been left damaged by past events? It's not long before the latter is confirmed, though a good way into the film before we discover, in a series of revealing flashbacks, the true nature of the circumstances in question. Kapurush has none of the playful character comedy of its companion piece and plays it consistently straight, a drama of regret infused with an increasingly potent sense of sadness. Despite outward appearances, all three characters are nursing their respective sorrows. Amitabha is enjoying a successful and interesting career, but since he and Kuruna parted he has failed to form an even remotely fulfilling relationship with another woman. Bimal's considerable wealth has bought him land, servants and local respect, but has left him creatively empty and addicted to alcohol. And while Kuruna plays the role of dutiful and contented wife, her marriage is one in which love plays no part. The American title of The Coward more directly captures the judgement the film passes on Amitabha, who shies away from the prospect of marriage and pays the long-term price. In this respect it plays as something of a morality tale, and while the happiness through commitment to marriage angle may play better for traditionalists than this old cynic, the underlying message, regarding how uncertainty and fear of change should not be allowed to act as barriers to opportunity and happiness, still hit home. 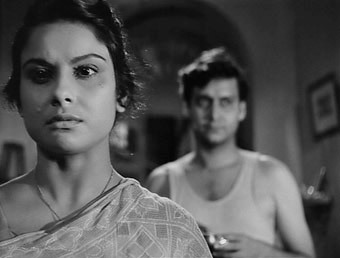 Although technically a little shakier than usual for Ray – the camera angles and movements are as well chosen as ever, but when the camera does move it sometimes does so unsteadily – Kapurush packs a disarmingly powerful emotional punch into its brief running time, and having made its moral accusation it has no intention of giving Amitabha an easy emotional ride. If it occasionally feels like a cinematic behavioural lecture, it's still a dramatically powerful work, a detailed and almost theatrical three-hander that intrigues, involves, and impressively avoids ever walking the easy narrative route. I think it's fair to say that for someone who arrived at the cinema of Satyajit Ray through his poignant social dramas, then Joi Baba Felunath, which is essentially a Sherlock Holmes style detective story, comes as the biggest surprise in this set. 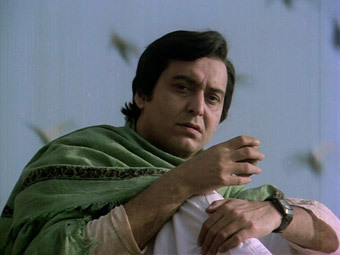 Of course it won't be for those more familiar with Ray's oeuvre, given that this was the director's second Feluda film (the first was the 1974 Sonar Kella), and that both were based on detective stories written by Ray himself, two of thirty-five published during his career. The detective in question is Prodosh Mitra, known as Feluda or Felu by his companions, and so great is his fame that even on holiday in the holy town of Benares he is instantly recognised by a star-struck hotelier and locals in need of his investigative skills. The scene is set even before Felu arrives, when the financially troubled Umanath Ghoshal receives a visit from old college friend Maganlal Meghral, who has done rather well for himself as an art smuggler. Meghral has heard all about the golden Ganesha idol owned by Ghoshal's father Ambika and is keen to buy it, and when his offer is politely declined he does not appear pleased. No surprises, then, when that night the idol is stolen from the safe in Ambika's bedroom. Who's to blame? Well given that there are several family members, an adopted son and even a few servants in the house, it's not as clear-cut as it first appears. Fortunately Felu is soon on hand to investigate, aided by young apprentice Topesh and unwaveringly cheerful Lalmohan Ganguly, a renowned author of children's mystery stories who writes under the pen name of Jotayu. Felu's investigation walks an uneven but always interesting path, but Felu himself only gets seriously involved after he and his companions pay a visit to Meghral. Here Felu is warned to drop the case and is shot at by an over-enthusiastic bodyguard, while Jotayu acts as a potential victim for a comically wizened knife-thrower, a smartly edited but slightly protracted scene that invites us to fear for Jotayu's wellbeing. We don't – or at least I didn't – because the scene's real purpose is to fire Felu up with a thirst for revenge and to set up a late-film re-run in which bullets are substituted for knives. Having almost no narrative purpose but considerably more fun are the trio's encounters with their room-mate Gunomoy Bagchi, a body-building Mr. Universe whose bulging muscles prove a source of wide-eyed fascination for Jotayu, whose accepted invitation to have a feel skates surprisingly close to homoeroticism. Other encountered characters prove more useful to the investigation, particularly Ghoshal's young son Ruku, who adopts the comic-book hero moniker of Captain Spark and clearly knows more about what has happened that he initially lets on. Making evocative use of his Ganges riverside location and filmed with his customary blend of static shots and fluid tracks, Ray shapes a playful mystery that is slow to get going but really piles on the twists in the final act. It's full of nice touches: the brief glimpse of cigarette smoke that sets up an entire plot strand; Felu's very Holmesian riverbank ponder and moment of revelation; the standard lamp that throws light onto Ghoshal but keeps Meghrai in sinister shade; Felu's introduction to Ambika that finds the old man reading Sir Hugh Greene's The Rivals of Sherlock Holmes (Penguin edition, of course); the camera movement that follows a set of keys as they are stolen and used to open the safe, reproduced when Ambrika retraces the criminal's steps. Ray's distrust of false prophets from Mahapurush also re-surfaces in the shape of a fake guru whose costume plays a key role in the story's resolution. As the trio of investigators listen to him stating the obvious in a revelatory voice – "There is one sun, there is one moon…" – Felu murmurs to his companions without a flicker of emotion, "I'm getting goose bumps." As with all three transfers in the first Satyajit Ray Collection, Mahapurush and Kapurush appear to be NTSC to PAL transfers – the running time of Kapurush is 5 minutes shorter than the generally accepted 74 minutes, suggesting a PAL speed-up, but those double-image freeze-frames are a bit of a giveaway. Contrast can be variable but is often solid and the detail on both is good. Some minor compression artefacts are visible in places, something that's exaggerated by upscaling to HD. The prints are reasonably clean, though dust spots remain here and there. There's the odd bit of damage on the print of Kapurush and a brief, three-shot section in Mahapurush during a chess game when the quality drop is substantial. Joi Baba Felunath, the only colour film in the collection, fares batter in that it's a PAL transfer and a rather good one, albeit from an imperfect source. Colour, contrast and detail are all pleasing and the blacks are strong, but there's plenty of dust around and even the odd lingering scratch. Slightly more distracting are the three light coloured vertical lines that appear in places, like the join marks on an old Cinerama transfer. On the whole, though, this is the best transfer of the two volumes. The soundtracks all betray their age with a mixture of crackle, background hiss and the odd muffled bit of dialogue. The real surprise here is Joi Baba Felunath, whose soundtrack is seriously distorted on louder music in a way you don't expect for a film made in the late 70s, whatever the source. As with Volume 1, just the same Ray biography on each disc. 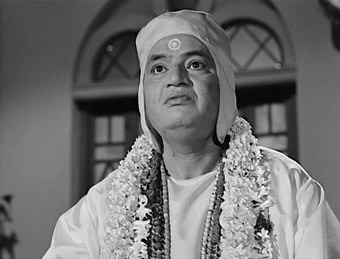 If Volume 1 served to illustrate Satyajit Ray's greatness as a filmmaker, Volume 2 demonstrates his versatility. Concern about a preachy edge to Kapurush is dispelled by the quality of the drama, and while it took me a while to really get into Joi Baba Felunath, once I did so I was sold and am now keen to hunt out its predecessor. But my favourite here has to be Mahapurush, whose blend of easy-going comradeship, cheerful but thoughtful cynicism and well judged character comedy completely won me over. Conversion issues aside, another must for Ray fans.